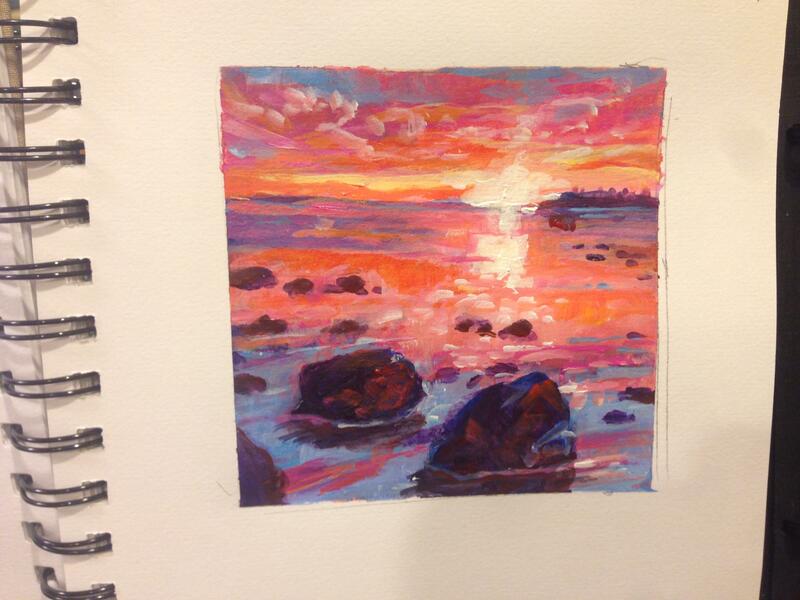 Painter Kaye Krapohl sketches in the early morning light of Grand Traverse Bay. In the background, Photographer Ken Scott. This story was produced during a workshop of the Interlochen College of Creative Arts. There’s not a trail around the perimeter of the Leelanau Peninsula. That means there are some hidden parts of the lakeshore rarely seen from land. It also means hiking those 98 miles is a big project. But some local artists are walking it, bit by bit, over the course of a year. As they do, they’re stopping to sketch and photograph the changing scene. It’s four in the morning and Ken Scott is sloshing through Grand Traverse Bay with a flashlight. He’s hauling his camera and tripod, and watching the Eastern sky. Kaye Krapohl slogs along behind Scott, carrying a sketchbook and thinking about color. “Usually there’s a little band of pink about this time but every day’s different so we just work with what we have,” she says. Once a week, Kaye the painter and Ken the photographer meet to explore the peninsula’s rough edges, places with no public access. Today’s location is a craggy stretch near Suttons Bay inaccessible by road or trail. It’s different than the first day of this journey, when they set out about three months ago at the county line near Traverse City. It was March 20th, the Vernal Equinox. The lake was still frozen after that grueling winter and the sky was crystal blue. The challenge today is a flat, gray light. He snaps pictures of ripples and reeds and shoreline patterns while Krapohl draws little scenes in her notebook that will inspire oil paintings back in her studio. Her Michigan landscapes are saturated with color - romantic and bold. From Kaye Krapohl's sketchbook: Lee Point Awakens. June 5th. “I’ve never worked with another artist and one of the challenges is getting to know each other’s boundaries and styles,” she says. The yearlong trek could result in a joint exhibit, but Scott says more than anything it’s a way to see the place he’s lived for 30 years in a fresh way. “It’s always interesting to get out and explore and to show other people what cool stuff they’re missing,” he says. The two artists are confounded for a moment by a spit of land covered with dense brush and surrounded by deep water. They talk about turning back, but agree to push ahead. Ken Scott wades around and Kaye Krapohl claws through the brush. On the other side of the spit there are swirling piles of bleached zebra mussel shells, a white shell beach. 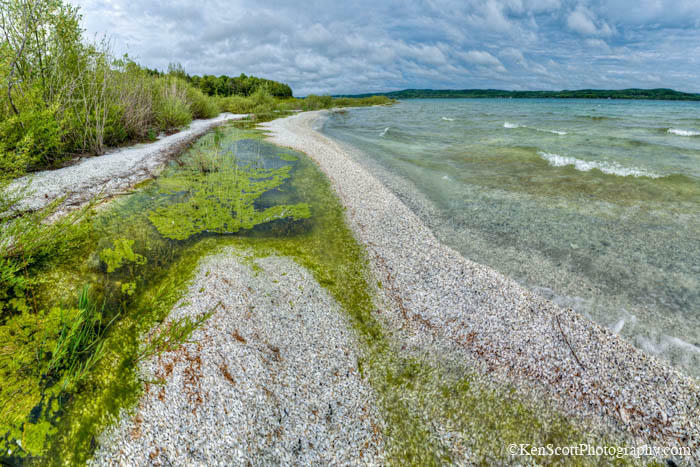 Ken Scott's image of the white shell beach discovered the day our producer trekked along with the two artists. This journey will end on the opposite side of the peninsula on March 20, 2015, the next Vernal Equinox. But that is months from now and many miles ahead. More of the work from this adventure will be on display Saturday at the Traverse City Wine & Art Festival. It took just days for area booksellers to run out of a book released last weekend on the Ice Caves of Leelanau. A second printing of the photography book by Ken Scott is already underway, after the initial 1,000 copies sold. “People that saw the ice caves want to see the book. People that didn’t see the ice caves want to see the book. It’s lovely… and it’s just a nice keepsake of the crazy winter that we had,” says Sue Boucher, who owns the Cottage Book Shop in Glen Arbor. She says her store alone sold at least 130 copies this week. A group that counts hawks and eagles as they migrate through the Straits of Mackinac tracked more than 43,000 birds this spring, including more than 800 eagles. 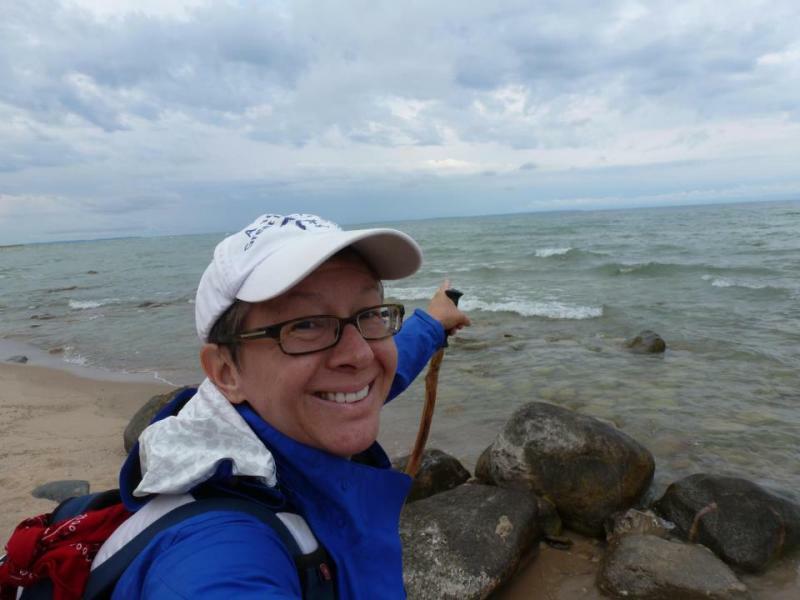 Listen to the full conversation with Kathy Bricker of Mackinac Straits Raptor Watch.